Chabad Lubavitch of Tampa Bay hosts a state-of-the-art facility that houses a clean, modern Mikvah. 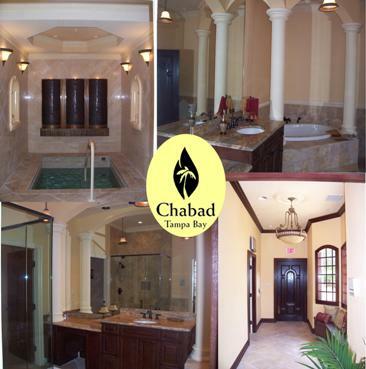 Modeled after a Mediterranean spa, Mikvah Mei Menachem of Tampa Bay includes lavish bathing facilities, a room for study and introspection, and an elaborate immersion room. Upscale toiletries and amenities are also provided. The Tampa Bay Mikvah offers an awareness of the beauty, importance and spiritual depth of the Mikvah. ~ a welcoming "sacred space" for all women of the Tampa Jewish community. ~ an opportunity for modern women to learn ancient yet timeless teachings which connect them to their ancestors, their soul and G‑d. ~ a strengthening of our community by enabling women to become more spiritually empowered and fulfilled. ~ nourishment and enhancement for marriages and families ultimately leading to a stronger, healthier community. To make an appointment please call 813.731.3619.